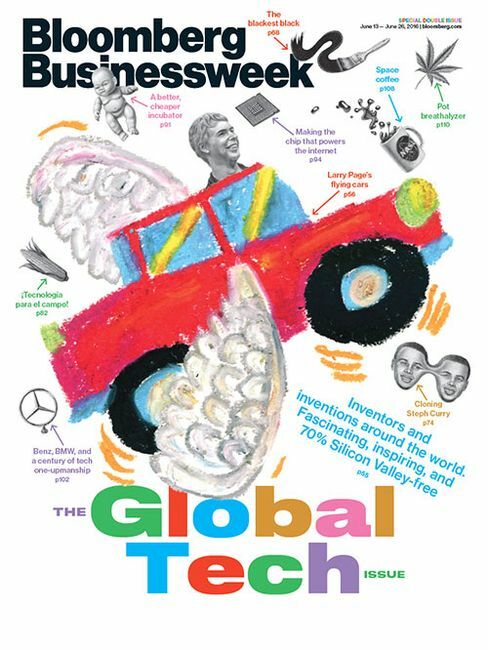 Featured in Bloomberg Businessweek, June 13 – 26, 2016.Subscribe now. Zee.Aero now employs close to 150 people. Its operations have expanded to an airport hangar in Hollister, about a 70-minute drive south from Mountain View, where a pair of prototype aircraft takes regular test flights. The company also has a manufacturing facility on NASA’s Ames Research Center campus at the edge of Mountain View. Page has spent more than $100 million on Zee.Aero, say two of the people familiar with the company, and he’s not done yet. Last year a second Page-backed flying-car startup, Kitty Hawk, began operations and registered its headquarters to a two-story office building on the end of a tree-lined cul-de-sac about a half-mile away from Zee’s offices. Kitty Hawk’s staffers, sequestered from the Zee.Aero team, are working on a competing design. Its president, according to 2015 business filings, was Sebastian Thrun, th­e godfather of Google’s self-driving car program and the founder of research division Google X. Page and Google declined to speak about Zee.Aero or Kitty Hawk, as did Thrun. Flying cars, of course, are ridiculous. Lone-wolf inventors have tried to build them for decades, with little to show for their efforts besides disappointed investors and depleted bank accounts. Those failures have done little to lessen the yearning: In the nerd hierarchy of needs, the flying car is up there with downloadable brains and a working holodeck. Northern California in particular has had a long fascination with flying cars. In 1927 a now mostly forgotten ­engineer named Alexander Weygers first began thinking up the design for a flying saucer that could zip between rooftops. In 1945 he received a patent for what he described as a “­discopter,” a vertical takeoff and landing (VTOL) machine with room inside for passengers to walk around, cook, and sleep. He depicted smaller versions landing in pods atop buildings in downtown San Francisco. No discopters were built, though it’s believed that the U.S. Army, which paid visits to Weygers’s compound in Carmel Valley, Calif., tinkered with a prototype. Today, the world’s premier ­flying-car enthusiast is Paul Moller, 79, a professor emeritus at the University of California at Davis. Fifty years ago, when he was teaching mechanical and aeronautical engineering, he developed a specific vision: an aircraft you could park in your garage, drive a few blocks to a small runway, then take skyward. He tested his first prototype, the XM-2, in 1966. The XM-2 resembled a flying saucer with a seat at its center protected by a plastic bubble. It managed an altitude of 4 feet, while graduate students held it steady with ropes. “We were worried if the machine got out of control, we might kill a few people,” Moller says. In 1989 his M200X made it to 50 feet above the ground. Then came the M150 Skycar, the M400 Skycar, the 100LS, the 200LS, the Neuera 200, and the Firefly, all variations on the same Jetsonian idea. In January 2000, Moller gave a speech on flying cars at the Palo Alto Research Center (PARC), the birthplace of the graphical user interface and, for nerds, sacred ground. 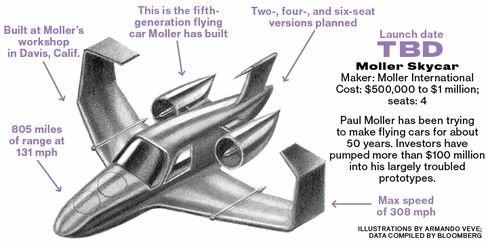 Afterward, an engineer in his late 20s walked up and said he was interested in the concept but was skeptical that streetworthy personal aircraft were technically feasible; at the time, Moller didn’t recognize young Larry Page. Moller kept trying. He says he burned through more than $100 million developing his designs and declared personal bankruptcy in 2009. Carmakers invested in other areas, too, that are helpful for building small electric planes, particularly batteries and the semiconductors that control them. Self-driving systems, like the kind Google uses in its Koala cars, are perhaps a decade away from mainstream use on the roads, but they may already be good enough for the skies. “Self-flying aircraft is so much easier than what the auto companies are trying to do with self-driving cars,” Moore says. Moore’s paper circulated, rekindling excitement. 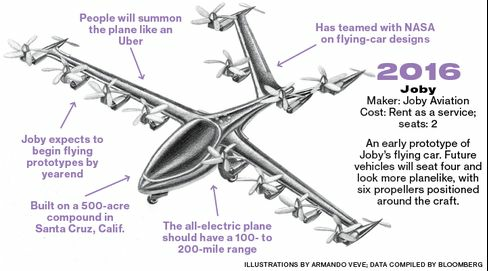 Sometime in 2009, a small group of engineers had begun meeting in Silicon Valley to discuss funding an electric-plane project. One of them was JoeBen Bevirt, a mechanical engineer and entrepreneur who had studied under Moller at UC Davis. Another was Ilan Kroo, an aeronautics and astronautics professor at Stanford. And another was Page. Although it initially looked as if they might all team up, Kroo and Page broke off to start Zee.Aero. Alone, Bevirt founded Joby Aviation, a company he hopes will beat Zee.Aero to market and prove that his efforts with Moller—and the older man’s life’s work—weren’t in vain. Bevirt owns a 500-acre compound near Santa Cruz, Calif. To get there, you turn onto idyllic California State Route 1 and drive past the boardwalk, a few blocks of strip malls, and 15 miles of undeveloped, windswept coastal dunes. Then you turn onto a dirt road, pass a lake and a grove of towering redwoods, and walk through gardens overflowing with lavender and roses. It’s here that Bevirt has built a series of workshops, plus housing for about half of his 35 employees. Bevirt grew up nearby on an electricity-free commune where his mom worked as a midwife and his father built custom homes. From a young age, he learned his way around toolboxes and construction sites, and was an avid reader. After consuming the sci-fi classic The Forever Formula in elementary school, he decided he wanted to build the kind of personal aircraft the book’s hero flew and persuaded a friend to help. “We built lots of prototypes, but they always crashed and burned,” he says. They shifted to custom bikes. The flying-car dream stuck with Bevirt as he entered UC Davis in 1991 to study mechanical engineering, and he quickly found himself working for Moller, building one prototype after another. Bevirt eventually concluded their shared dream wouldn’t be feasible until battery and motor technology improved. He figured he’d need to wait 20 years. “Paul had been working on this for 30 years, and he was 50 years ahead of his time,” he says. Bevirt got his bachelor’s, and then a master’s in mechanical engineering from Stanford. He worked in biotech after graduation, co-founding a company called Velocity11 that built robots to sequence DNA. His next company, called Joby (his childhood nickname), sold camera accessories such as flexible plastic tripods. Joby turned Bevirt into a multimillionaire. In 2008 he started Joby Energy, a maker of airborne wind turbines whose technology Google later acquired. The 20-year mark was approaching, so in 2009 he also used some of his wealth to buy the 500 acres and start Joby Aviation. Its headquarters is an engineer’s fantasyland. The focal point is a large wooden building where two dozen workers sit at a few rows of desks jammed with computers. Aside from the clusters of large black monitors, the place feels more like a barn than an office. Aircraft prototypes hang from the ceiling, as does a thick climbing rope for exercise. In the open kitchen, abutting a long redwood dining table in one corner, a cook uses ingredients from the nearby gardens to prepare three meals a day. While the smell of a Malaysian curry fills the room, a banjo twangs from speakers overhead. The manufacturing happens at a series of buildings about 100 yards downhill, past gardens and an outdoor clay pizza oven. One of the buildings is an airy warehouse with a giant oven inside—but this one isn’t for pizza. It’s used to cure the ­carbon-fiber bodies of the planes and looks like a Quonset hut. Former members of Oracle’s America’s Cup sailing team, some of the world’s leading materials experts, oversee the curing process, baking the carbon fiber at about 194F. In another building, engineers build ­cantaloupe-size electric motors; in a third, they test electronics; in a fourth, they put the finishing touches on wings and other parts. Out back, there’s a large truck with an extendible arm atop its trailer like a cherry picker, which hoists propellers high into the air so engineers can perform wind tests while driving down a road at high speed. Robotic prototypes buzz around. Sciarra and Bevirt hope to begin flying a human-scale prototype plane later this year. They won’t give the exact ­specifications but suggest that it could hold, say, a family of four and travel 100 miles or so on a full charge. The vehicle looks like a plane-helicopter hybrid packed with propellers, about eight mounted on the wings and tail. For takeoff and landing, the propellers hang horizontally like a helicopter’s and rotate for forward propulsion once in the air. Joby Aviation has already built smaller prototypes and has models of the plane’s body, wings, and propellers scattered about the manufacturing facilities. Bevirt and Sciarra see the vehicle taking off from parking garages, roofs, or areas alongside highways. They want to offer flights as an Uber-like service—summon a plane when you need it. The Joby aircraft looks similar to other vehicles being built around the world. In May the German company E-volo conducted manned flights of its Volocopter, a two-seat aircraft powered by 18 propellers. 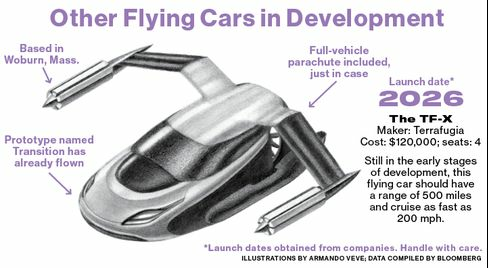 Other flying-car startups include AeroMobil, Lilium Aviation, and Terrafugia. Even Airbus has built a two-seater prototype at its Silicon Valley labs, say two people familiar with the designs. In 2013, Red Bull held one of its Flugtag competitions in Long Beach, Calif. Flugtag is a televised spectacle where hobbyists see how far they can launch their homemade flying machines off a dock. It’s more about entertainment than sustained flight—the contraptions generally dive straight into the water, and everyone laughs. At this one, though, a group called the Chicken Whisperers stunned the assembled crowd. Dressed in full-body baby-chick outfits, the team pushed its glider off the dock and watched as it cruised 258 feet, breaking the previous record of 229 feet. The chickens danced. They clucked. They took a swim in the water. They were all Zee.Aero employees in disguise, having fun, trying out some designs. At its outset, Zee.Aero was led by Kroo, the Stanford aerospace professor. He wrote the original Zee.Aero patent, No. 9,242,738, which shows a strange-looking one-seater aircraft with a long, narrow body. Behind the craft’s cockpit, rows of horizontal propellers run along both sides of the body of the plane to handle the VTOL work. There’s also a wing at the back with two more propellers that add forward thrust. Zee.Aero worked on this design for a couple of years. Small, computer-controlled versions of the aircraft were photographed by reporters and hobbyists sitting in the parking lot at 2700 Broderick Way. None of the prototypes were big enough to fit a human. Over time, the company realized this might not be the best design, according to three former Zee.Aero employees. Page also grew dissatisfied with the rate of progress. In 2015, Kroo returned to teach at Stanford full time but continued to advise Zee.Aero as “principal scientist,” while the com­pany’s engineering chief, Eric Allison, took over as chief executive officer. Under Allison, the company began work on a simpler, more conventional-looking design, now coming to life at the Hollister Municipal Airport. Hollister is a city of about 35,000 nestled among garlic and artichoke farms. Its airport is popular among amateur pilots because of favorable winds and a lack of commercial air traffic. There’s a flight school, a sky-diving business, and a few run-down buildings. The least shabby structure is Building 19, which has been taken over by a dozen or so Zee.Aero workers. The airport is open for business from 8 a.m. to 5 p.m. on weekdays, but Zee.Aero employees frequently run test flights when no one else is around. Nonetheless, people working at the airport have caught glimpses of two Zee.Aero craft in recent months. Both have a narrow body, a bulbous cockpit with room for one person upfront, and a wing at the back. In industry lingo, the planes are pushers, with two propellers in the rear. One of the prototypes looks like a small conventional plane; the other has spots for small propellers along the main body, three per side. When the aircraft take off, they sound like air raid sirens. The people at the airport haven’t heard Page’s name ­mentioned, but they long ago concluded Zee.Aero’s owner is super rich. Zee.Aero employees receive catered lunches—sometimes $900 worth of barbecue from Armadillo Willy’s, a local chain. Recently, the company purchased a $1 million helicopter to fly alongside the planes and gather data. The former Zee.Aero employees describe the company as a fun place to work but don’t downplay the serious expectations from Page. He wants the flying-car future, and he wants it now. If the atmosphere grew tense with Kroo’s departure, it didn’t lighten up when the Kitty Hawk team arrived. Kitty Hawk has about a dozen engineers, including some Zee.Aero veterans. 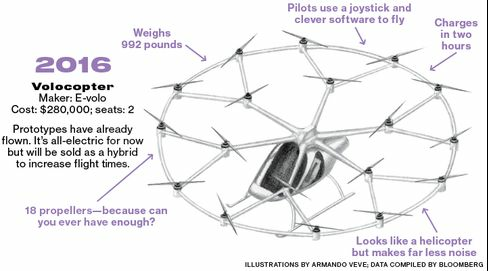 Others came from Aerovelo, a startup whose claim to fame was winning the $250,000 Sikorsky Prize in 2013, for building a human-powered helicopter that could stay aloft for more than a minute. Kitty Hawk employees include Emerick Oshiro, who did self-driving car work at Google, and David Estrada, who handled legal affairs for Google X. They all listed the company as their employer on LinkedIn until they were contacted byBloomberg Businessweek, at which point they erased any mention of Kitty Hawk from their profiles. There’s no guarantee that Kitty Hawk’s or Zee.Aero’s or anyone else’s flying cars will ever take to the skies. There are still technology problems to solve, regulatory hurdles to cross, and urgent safety questions to answer. Page once vowed to a colleague that if his involvement in the sector ever became public, he might pull support from the companies. Here’s hoping that’s not true. If nothing else, these projects show that bold, some might say far-fetched, invention is alive and well in Silicon Valley. The place that spent the past decade focused on social network apps has trained its engineering powers on robots, cars, and now aviation. “We were promised flying cars, and instead what we got was 140 characters,” a local venture capitalist once put it. Page and his cohorts are trying to get us both.